That poem spoke to me because I was that queer young girl, sitting in the front of my creative writing class, trying to parse through the fact that I never saw the complexities of my identity within the quatrains and sonnets of the past. I remembered changing the names of the people I had crushes on in conversation so I wouldn’t be seen as the queer young girl. Now I embrace that label with pride. 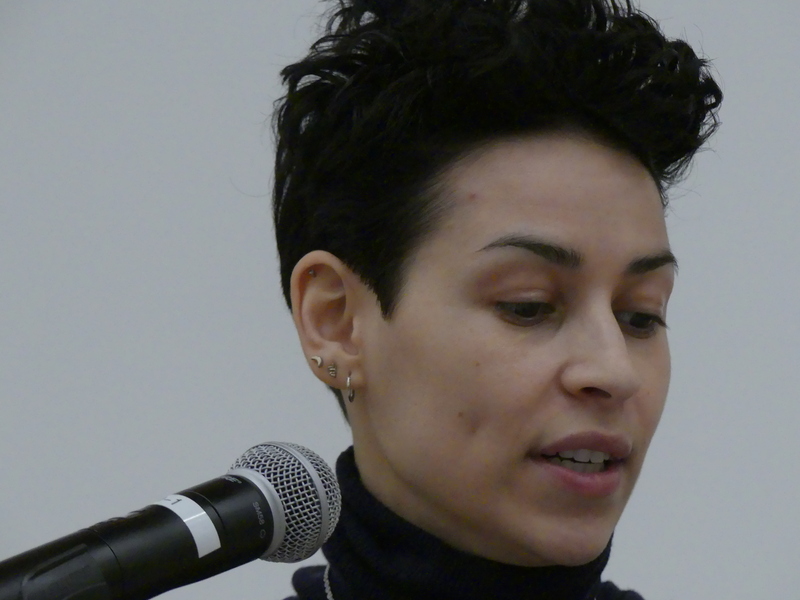 On Thursday, March 7, Denice Frohman, author of the poem referenced above, was the keynote speaker for Multi week. She shared poems throughout her speech, which was followed by a question and answer session for the audience of over 30 people in the Intercultural Center Dome. She acknowledged the artistic lineage that came before her, knowing that her ability to write as she does comes from them. She cited Cherríe Moraga, author of “This Bridge Called My Back,” as one of her major inspirations many times. “The books that mattered most to me were not assigned to me,” she said, explaining how Moraga had impacted her work. This set the tone of many portions of her speech where she recommended different authors and books for the audience to read. After she said the name of the book she would look out across the audience and remind them to “write this down,” often to the crowd’s laughter. Despite, or maybe because of the humor of her serious, almost motherly nature, many in the audience did, in fact, rush to write down all she said. The experience of not seeing ourselves within the literature that we are taught resonated with many of us in the audience. For Frohman, she was constantly at odds with society over her Latinidad. She said that even her Latinidad was multi because of her Puerto Rican, white-passing identity. Frohman witnessed the constant discrimination her mother faced because she had a thick accent. The white Americans surrounding them viewed it as representative of intelligence rather than what it actually was — an accent. Frohman’s mother’s experiences were juxtaposed with her own. She knew that she was white-passing and that she had to teach herself Spanish, which was her mother’s first language. Eventually, Frohman realized that her language wasn’t always accessible to her mother. “I get you but I don’t always understand you,” Frohman’s mother told her once. After that, Frohman always started her conversations with her mother in Spanish. When asked about how she found her voice in her writing, Frohman explained that it was more a matter of what kept her from it in the first place. She noted the failures in her public education that affected what she thought was within her reach. She now knows that there is a power in telling your own story and defining it for yourself. “You inherit a script of what you’re supposed to be,” Frohman explained. Those words resonated very deeply within me. The script that was given to me was one that I could never quite fit into — a puzzle piece that was the correct shape but one of the edges wasn’t quite right. To find happiness and contentment, I had to realize that I would never fit in that puzzle because it was the wrong one. Frohman’s poetry helped me to realize that — from high school to today. She put into words the stories so many people hold but don’t have the language to share. To then take that experience and see it all in person was an incredible experience that I could never put into words — at least not in a way that does it justice. Seeing the complexities of having identities that intersect and interact in a multitude of ways was so powerful because rarely in society do we ever allow people to be everything that they are, at once. We require people to pick the part of themselves that they are the “most,” and then leave the rest of themselves behind. Denice Frohman shows us that we don’t have to dissect ourselves into fractions. We can be the complete versions of ourselves no matter what society asks of us. Shelby Dolch '21 is from Montana and intends to special major in Political Science and Black Studies with a second major in Peace and Conflict Studies. She is most interested in the areas of criminal justice reform, human rights, and domestic policy.